Congratulations! You won the first place in my contest "The Alphabet contest: C"! What about... This dress is so rich in detail... and one more beautiful than the other! The folds of the skirt, the ruffles top, the beadwork on the waist and especially on the gown's edge... but what strikes me most is the brightness of the colors! Just stunning! Compliments! Thank you both very much for your lovely comments! This is such a uniquely beautiful design! The amount of detail is incredible. Definitely adding it to my favorites! It is so astonishing to me how you could take a (lovely, of course) sea creature and transform it into such a divine gown. The blending of colors is flawless, and the originality in the peplum layering at the waist is not only beautiful, but an excuse for me to look at your amazing folds once again. 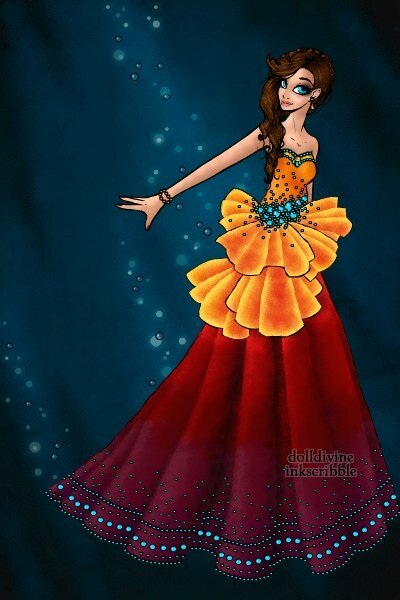 I love how you utilized the coral hind's spots into almost glowing beading, especially at the bottom of the gown. It's mesmerizing. Even the bubbles and lighting are perfect and atmospheric! I wish I could be this good! You've earned another pretty crown!